A clafoutis is a very traditional French cake. It is usually made with pitted fruit such as cherries or plums. If you make it with cherries, leave the pits in the fruit. They add a great flavour to the cake. Just remember to tell your guests you did! Preheat the oven to 350˚F. Butter an 11-inch oval oven-proof baking dish and sprinkle with demerara sugar, tapping out any excess. 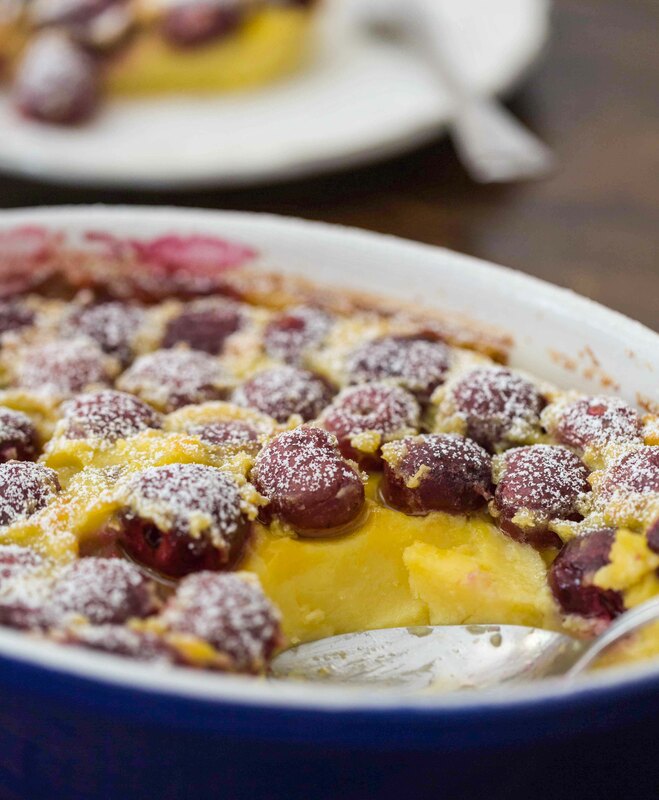 Scatter the cherries all over the bottom of your prepared dish and set aside. In a medium bowl, whisk together the flour, sugar and salt. In another bowl, mix together the eggs, butter, cream, milk, vanilla and lemon zest. Whisk your dry ingredients into your wet ingredients until just combined. Pour the batter over the cherries and bake in the preheated oven for 30-35 minutes, or until it is puffed and golden on top. Remove from the oven and cool for about 5 minutes. Sprinkle with demerara or icing sugar and serve while still warm. The cake tends to fall slightly as it cools. Spoon the cake out of the pan to serve.